Congratulations are in order for Father Deacon Damjan Bozic, current Treasurer of the Serbian Orthodox Clergy Brotherhood of North and South America and a cleric with the Midwest Metropolitanate of the Serbian Orthodox Church based in Chicago, Illinois. 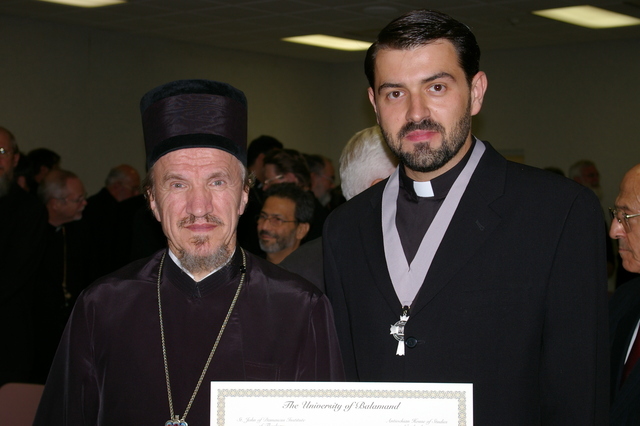 With His Grace Bishop Dr. MITROPHAN, Bishop of Eastern America and Professor of New Testament at St. Sava School of Theology participating, Father Deacon Damjan received the Master’s Degree in Applied Orthodox Theology from St. John of Damascus School of Theology of the University of Balamand. 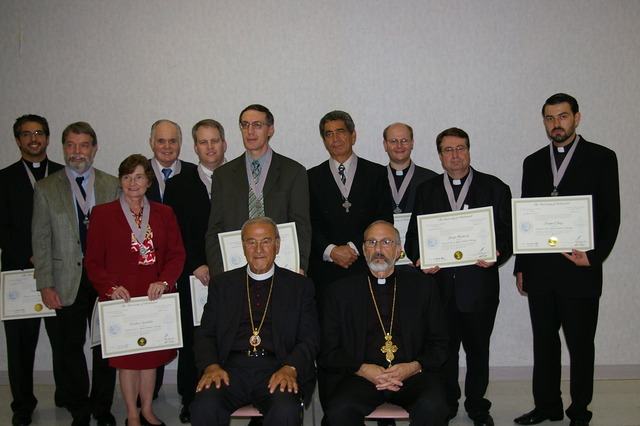 Graduation ceremonies were held for the House of Studies, Antiochian Village, Ligonier, Pennsylvania in conjunction with the Clergy Symposium of the Antiochian Archdiocese. His Eminence Metropolitan PHILIP, the hierarchs and clergy of the Antiochian Orthodox Archdiocese were active participants and witnesses for this honor. Father Deacon Damjan is a 1998 graduate of Saints Cyril and Methodius Seminary in Prizren, Kosovo and Methohia. He graduated from St. Sava School of Theology in Libertyville, Illinois in 2003 with a B.A.in Divinity. 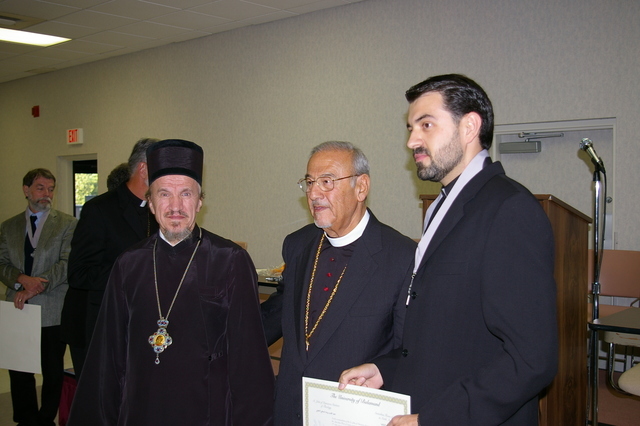 Father Deacon Damjan’s thesis for his Master’s Degree was entitled: “Relationship Between Church and State in Serbia 1331-1355” Mentor for the thesis was The Rev.Dr.Patrick Viscuso, Professor of Canon Law, Past President of the United States Byzantine Studies Conference and specialist in Byzantine and Oriental ecclesiastical legislation. Deacon Damjan has been serving as Cathedral Deacon for Holy Resurrection Serbian Orthodox Cathedral in Chicago, Illinois and as Director of Religious Education. He also has been teaching at St. Sava Academy. Immediately following ordination, Deacon Damjan was appointed as clerk at the See of the Midwest Metropolitanate. Since receiving his Master’s Degree in Applied Orthodox Theology, His Eminence Metropolitan CHRISTOPHER has appointed Father Deacon Damjan as Dean of Students for St. Sava School of Theology. Father Deacon Damjan married his wife Marnie (Navarro) following graduation from St. Sava School of Theology. His Eminence Metropolitan CHRISTOPHER ordained Deacon Damjan to the Diaconate on August 31, 2003. Even though he has already accomplished much academically, Deacon Damjan is continuing his education. He attends voice lessons and solfege with Professor Loraine Manifold of Park Ridge, Illinois. Father Deacon Damjan will begin Doctor of Ministry studies at the University of St. Mary of the Lake, Mundelein, Illinois this fall. Father Deacon Damjan comes from a family serving the Church. His father, Protopresbyter Stavrophor Slavko Bozic is head priest at St.George Church in Belgrade. An uncle and brother-in-law serve the Serbian Orthodox Church in Belgrade and Deacon Damjan’s brother is a student at the Theological Faculty of Belgrade University. Prota Slavko and Protinica Bosiljka Bozic have reason to feel good about the accomplishments of their son Father Deacon Damjan. Since his birth in November, 1978, he has invested much of his life in God’s Holy Church. Upon the recommendation of His Holiness Patriarch PAVLE, Father Deacon Damjan came to the United States to study at St. Sava School of Theology. His Grace Bishop Dr. MITROPHAN served as Deacon Damjan’s Professor of New Testament at St. Sava School of Theology. It is fitting that His Grace Bishop Dr. MITROPHAN would be present for Father Deacon Damjan’s graduation for this advanced degree. May God grant Father Deacon Damjan many, many years of service in His Holy Orthodox Church. May Father Deacon Damjan continue to grow in knowledge and service of the Lord Jesus Christ.